Volatilityis likely to rise and vix will cross 20 this week. The sell off will continue to add pressure on EU finance minister to release bailout to Greece, which will cause gold n silver to rally temporary on Nov 12th. 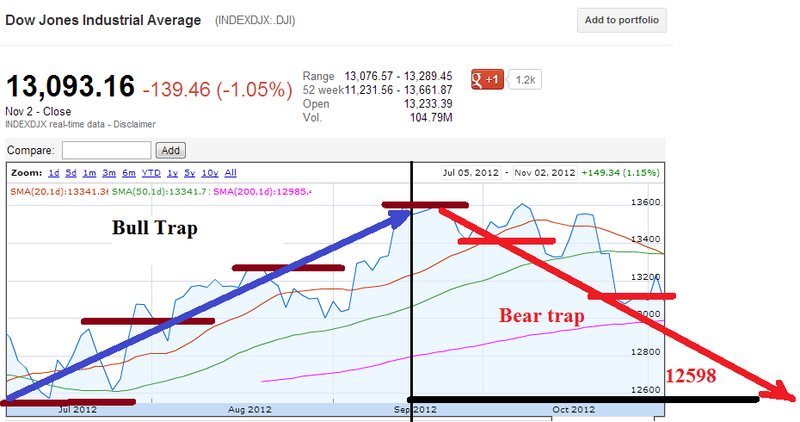 Bull and Bear Trap in Dow jones. 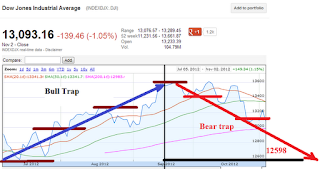 Goog long term bearish trend in formation. Southern Company ( SO ) is reporting for the quarter ending September 30, 2012. The electric power utilities company's consensus earnings per share forecast from the 11 analysts that follow the stock is $1.14. This value represents a 6.54% increase compared to the same quarter last year. SO missed the consensus earnings per share in the 1st calendar quarter by -8.7%. Time Warner Cable Inc ( TWC ) is reporting for the quarter ending September 30, 2012. The cable tv company's consensus earnings per share forecast from the 17 analysts that follow the stock is $1.41. This value represents a 27.03% increase compared to the same quarter last year. TWC missed the consensus earnings per share in the 3rd calendar quarter by -2.63%. Sysco Corporation ( SYY ) is reporting for the quarter ending September 30, 2012. The wholesale food company's consensus earnings per share forecast from the 9 analysts that follow the stock is $0.50. This value represents a -9.09% decrease compared to the same quarter last year. SYY missed the consensus earnings per share in the 2nd calendar quarter by -1.85%. The "days to cover" for this stock exceeds 13 days. Transocean Ltd. ( RIG ) is reporting for the quarter ending September 30, 2012. The oil & gas drilling company's consensus earnings per share forecast from the 20 analysts that follow the stock is $0.76. This value represents a 2433.33% increase compared to the same quarter last year. Silver Wheaton Corp ( SLW ) is reporting for the quarter ending September 30, 2012. The mining company's consensus earnings per share forecast from the 8 analysts that follow the stock is $0.40. This value represents a 5.26% increase compared to the same quarter last year. TE Connectivity Ltd. ( TEL ) is reporting for the quarter ending September 30, 2012. The electrical instrument company's consensus earnings per share forecast from the 11 analysts that follow the stock is $0.74. This value represents a -16.85% decrease compared to the same quarter last year. TEL missed the consensus earnings per share in the 4th calendar quarter by -5.71%. Entergy Corporation ( ETR ) is reporting for the quarter ending September 30, 2012. The electric power utilities company's consensus earnings per share forecast from the 6 analysts that follow the stock is $1.96. This value represents a -44.48% decrease compared to the same quarter last year. Humana Inc. ( HUM ) is reporting for the quarter ending September 30, 2012. The hmo company's consensus earnings per share forecast from the 16 analysts that follow the stock is $2.05. This value represents a -19.29% decrease compared to the same quarter last year. Rockwell Automation, Inc. ( ROK ) is reporting for the quarter ending September 30, 2012. The industrial company's consensus earnings per share forecast from the 12 analysts that follow the stock is $1.32. This value represents a -5.04% decrease compared to the same quarter last year. ROK missed the consensus earnings per share in the 1st calendar quarter by -8.66%. IntercontinentalExchange, Inc. ( ICE ) is reporting for the quarter ending September 30, 2012. The securities exchange company's consensus earnings per share forecast from the 16 analysts that follow the stock is $1.72. This value represents a -8.02% decrease compared to the same quarter last year. In the past year ICE has met analyst expectations once and beat the expectations the other three quarters. Church & Dwight Company, Inc. ( CHD ) is reporting for the quarter ending September 30, 2012. The cleaning company's consensus earnings per share forecast from the 13 analysts that follow the stock is $0.59. This value represents a 9.26% increase compared to the same quarter last year. In the past year CHD has beat the expectations every quarter. The highest one was in the 2nd calendar quarter where they beat the consensus by 1.82%. Kosmos Energy Ltd. ( KOS ) is reporting for the quarter ending September 30, 2012. The international company's consensus earnings per share forecast from the 6 analysts that follow the stock is $-0.09. This value represents a -169.23% decrease compared to the same quarter last year.